When you are filling out a bad credit loan application, you want to keep some things in mind so that you can increase the odds of your approval. Here are a few things that you should consider doing when you are filling out a bad credit loan application to improve your chances. One of the best things that you can do when you are trying to get a bad credit loan is to find a cosigner. Getting a cosigner is going to increase your odds substantially. The reason for this is that the lender is going to evaluate the credit of the cosigner instead of your own. Therefore, if you find a friend or family member that has a good credit history, you are going to have a much better chance of getting approved than if you go it alone. The cosigner is taking on additional risk because they are going to be ultimately responsible for the repayment of the loan. If you do not repay the loan, they are going to have to take over the payments. Because of this, you might have difficulty finding someone that wants to cosign the loan with you. However, if you can find someone it is going to help you immensely. When you are filling out a bad credit loan application, you need to make sure that you report all of the different sources of income that you might have. Some people only want to put information about their primary employment. However, if you make additional income from some other source, you should definitely include it on your loan application. 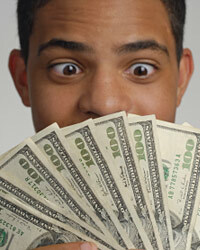 When you have bad credit, having a larger income is going to help your chances of getting approved. Because of this, you will want to include as much income as you possibly can on your application. Include a spouse's income, income from any side businesses, or any self-employment income that you have. This will help your chances of getting approved substantially. Something else that you will want to keep in mind is that you should always completely fill out the loan application. Many people rush through the application and end up missing an important part of the application. When you are filling out the loan application, you want to make sure to take your time and fill in everything that is asked of you. Lenders are going to ask for quite a bit of information from you and you need to do the best that you can in order to provide it to them. If you leave something blank, the lender may not be willing to approve you for the money that you need. Even if you think that putting something on the loan application could hurt your chances, you need to be honest and fill it in anyway. You do not want to be accused of fraudulently filling out your loan application with false information.